To every thing there is a season..
a time to keep silence, and a time to speak.. Horror, disgust and incredulity come first, usually followed by tears, heartbreak and compassion. And sometimes there’s a prayer, even from the non-believer. Each of us processes dismay and deals with grief differently. For some, they are dissected, scrutinised and embalmed within minutes; for others, they gnaw at the soul for weeks and months, and the consecrated mourning becomes a shrine in the temple of sacred memory. Anyone who profanes the holiness, let him (or her) be anathema. Perhaps Ms Pearson had processed her dismay and grief a little quicker than Mr Smith managed to, but either way, it seemed insensitive and indecent, to say the least, to score points off Islamist bombs in Brussels for the Leave/Brexit cause. And yet..
Those Remainers and Europhiles who condemn Brexiters and BeLeavers for scoring crass political points appear blind to their own hypocrisy. ..within minutes of the news of the appalling murders yesterday, some Brexiters had pounced to try to score points about the EU referendum. It wasn’t just Allison Pearson’s tweet about ‘Remainers dare to say we are safe in the EU’, retweeted by Farage. It was also UKIP’s Mike Hookem saying “this horrific act of terrorism shows that Schengen free movement and lax border controls are a threat to our security”. Too soon? You betcha. Yet it reminds me of a conversation I had with one Brexit minister a few weeks ago. He said that there were two big ‘events’ that could tip undecided voters towards Out: a big new migration crisis or a terrorist attack. The timing was crass but to be fair to the Brexiters, many were just expressing anger at the oft-repeated No.10 line that ‘security’ and ‘terrorism’ was a reason for staying In. Indeed Downing Street yesterday while showing distaste at the way some linked the atrocities to the referendum, went out of its way to stress this was a ‘shared threat’ across Europe, that our security services were working closely with Belgium and that the PM had signed a statement reaffirming ‘European values’. 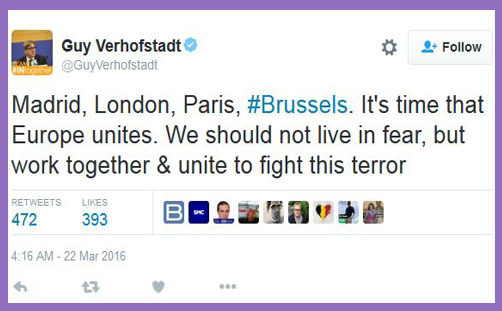 Former Belgian prime minister Guy Verhofstadt tweeted about the need to “work together & unite to fight this terror”. He’s right, of course. But we can do that perfectly well without being in the EU (which is made up of just 28 of 50 independent European states, all perfectly capable of collaborating and cooperating in pursuit of the common good). Perhaps as leader of the Group of the Alliance of Liberals and Democrats for Europe and founder of the inter-parliamentarian federalist Spinelli Group, Mr Verhofstadt wasn’t inclined to remind us of that. Or perhaps it simply wasn’t the time. Home Secretary Theresa May also used the Brussels attacks as an opportunity to spout about the imperative of intelligence data sharing for the effective functioning of the EU’s common security policy. She can say that, it seems, with free licence, but God help you if you tweet about the fact that common security policy isn’t really working too well; or allude to the fact that the Brussels bombers can drive to and from Paris without any kind of security/identity checks at all. It’s okay if you’re a respected Tory peer to trash Schengen and the “flawed” EU and to make a case for Brexit, but if you happen to lead Ukip and say the same thing, well, that’s not only crass and insensitive; it’s racist, bigoted, xenophobic and devoid of all reason. And if you want to appropriate the horrors of Islamist suicide bombings to sermonise that this is “nothing to do with Islam”, well, that’s fine, too. In this season of Lent and Holy Week, we lament such outbursts of violence. As we heal together as inhabitants of Brussels and Europe — and brothers and sisters in humanity — we need to find our way anew, and must all contribute to building societies where everyone feels secure and partakes of the common good. In the great Holy Week of Christian prayer and mercy, the Brussels attacks shock all those who seek peace and justice through the terrible cruelty and utter separation from all that is of God. Once again we see the contrast between the vain efforts to terrify through indiscriminate murder, and the call of God to be those who show mercy, who seek peace and pursue it. Let us at every service this week pray for those caught up in the traumatic events at the airport and in the City of Brussels. What a horror these clerics are. Dust not even settled and they try to make a religio-political point in the cause of religious inculcation under the guise of holy compassion? For shame.